100% (258) have seen it. 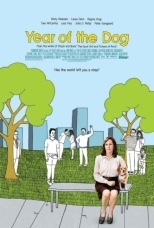 Molly Shannon plays Peggy, a happy-go-lucky secretary who is a great friend, employee, and sister living alone with her beloved dog Pencil. But when Pencil unexpectedly dies, Peggy must find meaning in her life. John C. Reilly, Peter Sarsgaard, Regina King and Laura Dern turn in great comic performances as the significant people in Peggy’s life who give her ill-fitting advice.